Finding the best place to eat, get your teeth cleaned, get a haircut or buy groceries in your local neighborhood can sometimes be a daunting task using the Web. While there are some sites like Yelp that lend a helping hand they don't cover everything you might be looking for and they certainly do not have all of your friends recommendations. Loladex, a Washington, DC based startup, which just officially launched today is looking to offer prioritized search based on recommendations of Facebook friends. Loladex, founded by Laurence Hooper and Dan Goodman both formerly of AOL, is looking to offer true word of mouth by creating a compelling local search engine experience for just about anything in your area. Loladex uses a licensed database of local listings and enables users to submit their active inputs from thumbs up/down and a 140 char description on any listing to help creating recommendations. Loladex is also partnering with local content providers to offer reviews. For example, Washingtonian magazine will be a default trusted source offering additional search result backfill content. OpenTable, IndieCoffeeShops and ServiceMagic will also be worked into the mix. I recently talked with both founders and we discussed their strategy in launching Loladex on Facebook in only DC. They explained that they wanted to work with a smaller subset of an existing social graph so they chose to start by focusing on just the local Washington, DC metro area and leverage Facebook's existing large social graph. But they plan to take it on to other cities and other social networks once spend some time perfecting the recommendation engine. I see user participation or buy-in as one of their largest obstacles for Loladex, so focusing on just one local area to start makes sense to start out. Loladex was founded in October 2007, self-funded and developed by Viget Labs. 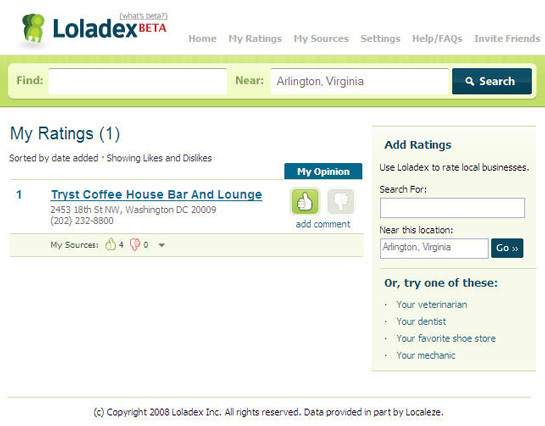 You can add the Loladex Facebook application today and start recommending places to go and things to do.